Call the San Diego divorce lawyers at The Law Offices of Doppelt & Forney to help you through your divorce, legal separation or paternity case. With over 50 years combined experience in California family law, you can trust us to protect your rights. Is Fortnite a cause for divorce? According to a study by Divorce Online, the answer is yes. By now, we’ve all heard of the popular video game, Fortnite. In just one year, Fortnite exploded to 125 million registered players, and it’s not only kids and teens that play. In fact, almost 75% of all gamers are over 18 years old. While Fortnite is a fun hobby for most, for a small percentage of gamers, gaming addiction is a real issue that can potentially be a cause of divorce. In a recent study, 38% of Fortnite gamers play for 11 or more hours a week. This disorder not only affects the person’s physical, mental and financial well-being, it also affects the people around this person. According to a study by Divorce Online, 200 U.K. couples cited video games as a reason for wanting a divorce so far in 2018 (September), which is about 5% of the divorce petitions Divorce Online received this year. This likely means there are thousands more divorce cases citing video games as a reason for divorce worldwide. Unfortunately, for those with a gaming disorder, it is not as easy as just “putting down the controller”. A 2013 Brigham Young University study found that 72% of non-gaming spouses felt that their partner’s gaming had negative effects on their relationship. From feelings of loneliness, isolation to frustration, marriage to a spouse with a gaming disorder can be extremely lonely and feel like an uphill battle with no signs of improvement. Even with Fortnite taking the blame for hundreds of unhappy marriages, there are no signs of this popular video game slowing down. Since launching in 2017, Fortnite has brought in $1 billion dollars, and Epic Games has pledged $100 million in prizes at Fortnite competitions over the next year. In the dawn of the digital age, we can only expect these new, digital-focused issues such as gaming disorder to be an increasingly prominent reason for divorce. With 40 million players logging in every month to play, we can only anticipate divorces due to video games to become more common. If you suffer from gaming addiction, seek treatment from a professional. Are you getting a divorce? Don’t go through it alone. 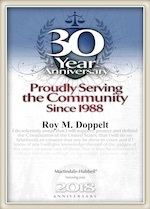 The San Diego divorce lawyers at The Law Offices of Doppelt & Forney will be there through every step in this often extremely emotional and confusing process. You can count on us to aggressively protect your rights and fight for your best interests. Call us today for your free consultation. We serve clients throughout the San Diego metropolitan area, including clients residing in Chula Vista, Carlsbad, Coronado, La Mesa, Vista, La Jolla, Del Mar, Ramona, Oceanside, Point Loma and other nearby municipalities.